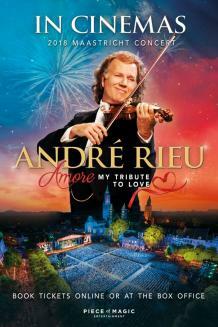 Andre Rieu’s hometown Maastricht concert this year celebrates love. ‘Amore, My Tribute to Love’ is the renowned violinist's tribute to his love for music, and his love for both of his families: his wife and children, and of course for his Johann Strauss Orchestra, with whom he has performed for over 30 years. It follows on from the release of his album ‘Amore’ last year, which features his own versions of classic love songs, from the world's of popular and classical music. Set against the incredible backdrop of the medieval town square, fans flock annually from all corners of the world to watch André perform with his 60-piece Johann Strauss Orchestra and some very special guests. The concerts are packed full of humour, fun and emotion for all ages.